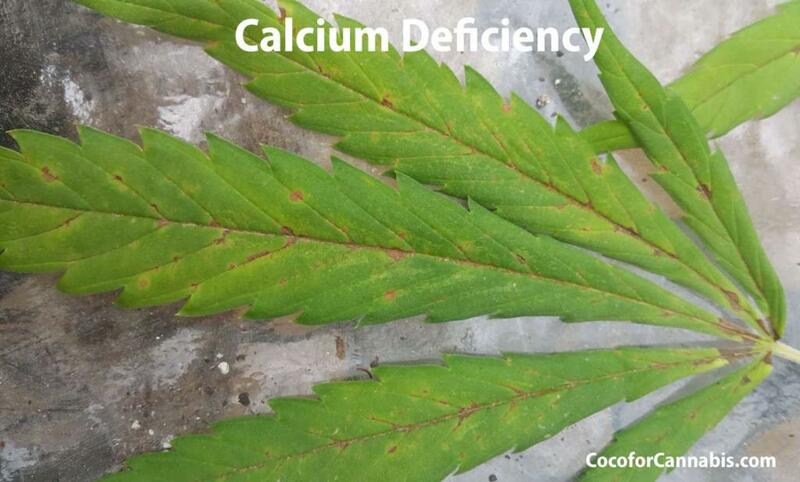 Calcium and magnesium deficiencies are the most common nutrient problem with coco grows. 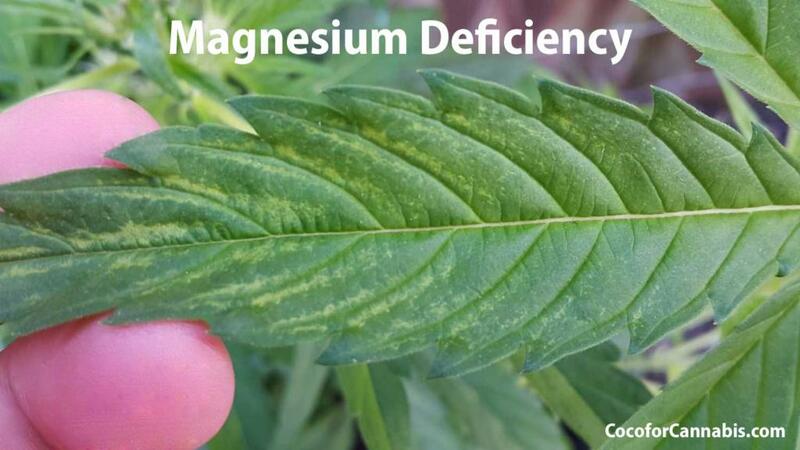 To avoid these problems and effectively manage your fertigation, it is important to understand the relationship that coco has with calcium and magnesium. In this article, I explain the basics of cation exchange in coco to help you understand why you need calmag supplement when growing in coco. I also provide specific instructions for when to use calmag in coco and how much calmag is needed at different times during the grow. All cannabis fertilizers come with Calcium (Ca) and Magnesium (Mg). This leads some growers to wonder if Cal Mag supplement is really needed. However, when you are growing in coco you have to be aware that the coco itself requires a certain dose of calcium and magnesium. The cation exchange sites in coco will lock on to the Ca and Mg and render them unavailable to the plant. We must provide larger doses to ensure that there is some Ca and Mg available to the plant! Buffering the cation exchange sites with calmag prior to use is critical. See our tutorials, “How to Prepare and Buffer Coco Coir” and “How to Reuse/Recycle Coco Coir”. However, even if you buffer the coco thoroughly, or use a pre-buffered coco product, such as Canna or Roots Organics, you should still add additional Cal Mag supplement to all irrigation water during the grow. Coco is known as a neutral grow medium, but there are cation exchange sites in coco. These sites on the surface of the coco fibers will form bonds with particular nutrient cations. The cation exchange capacity of coco is unlike soil or other grow media. There are far fewer exchanges and the exchange sites will become stable (buffered) once they attach to Ca or Mg. The cation exchange sites in coco naturally come loaded with sodium (Na) and potassium (K) cations. However, the sites have a weak hold on the Na and K cations. In the presence of calcium (Ca) or magnesium (Mg), the sites will release their Na or K cations and lock onto the Ca or Mg. Once the cation exchange sites in coco have locked on to Ca or Mg, they are “buffered” and stay stable. The cation exchange sites in unbuffered coco can pull nearly all the Ca and Mg out of a nutrient solution. If you try to grow cannabis plants in unbuffered coco, they will experience Ca deficiency. This is tough to correct while plants are growing because Cal Mag supplements have a strong impact on electrical conductivity (EC). As a result, the total dose of CalMag that you can provide is limited, even though it all may be going to the coco and none to the plant. Buffering the coco in advance is a critical step to creating an ideal growing media. However, even in fully and properly buffered coco, you should continue to provide additional Cal Mag supplement. Why do you need Cal Mag Supplement If the Coco is Buffered? The simple answer is that the coco is constantly breaking down. As large fibers of coco break down in the pots they expose new surface areas of the coco fiber. This also exposes new cation exchange sites that will take Ca and Mg from your nutrient solution and reduce the amount available to the plant. You should add CalMag supplement to all the irrigation water that you provide to the plant throughout the grow. 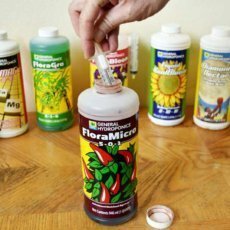 When adding Cal Mag supplement, you are not adding it for your plants! You are adding it to satisfy the coco. 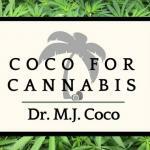 The amount that you need to add reflects the needs of the coco, not the plant. Coco breaks down due to a variety of factors, but you can expect it to need the most Cal Mag supplement early in the grow. The fresh coco will have the greatest potential to break apart and this is hastened by the roots of growing plants. Young plants spend much of the energy pushing their roots through the coco. As they do so, they contribute to breaking it down and create an ongoing need for additional Ca and Mg to be added. Later in the grow, as plants are flowering, the coco will have become more stable and as a result it will need less Cal Mag supplement. This is helpful, as Bloom Boosters can step in and fill the EC quota that CalMag can surrender. 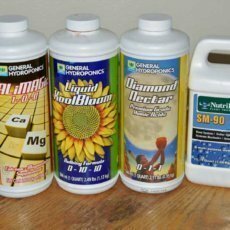 I use and recommend General Hydroponics CaliMagic. It is formulated to deliver a high dose of Ca and Mg without significantly contributing to the amount of nitrogen, phosphorous or potassium. When selecting a CalMag product, be aware of the quantity of nitrogen (N) in particular. N is the first number in the three number set listed on all fertilizers, for Calimagic it is 1-0-0. Many CalMag products also deliver high doses of N, which can create problems with your nutrient element ratio. The specific dose required will depend on the CalMag product that you are using. Cal/Mag supplements have a strong impact on Electrical Conductivity (EC). As a result, they must be dosed carefully. The amount of Calmag that you use will limit the doses of the other nutrients that will be added. 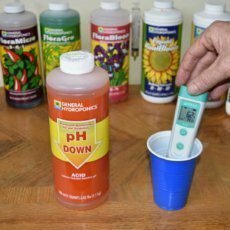 To understand more about dosing nutrients and the importance of EC, read our articles, “Understanding Osmosis and EC” and “How to Mix Nutrient Solutions”. Because CalMag has a strong impact on EC, it takes up a lot of your “EC budget”. For example, I recommend providing nutrient solution at an EC of 1100-1200 during vegetative growth. However, a full-strength dose (5ml/gal) of Calimagic accounts for about and EC of 800. That leaves only 300 EC left in the budget for all the other nutrients. If you are confident in your buffer, you may lower the dose to make room for other nutrients, especially late in flowering. However, some Cal/Mag supplement should be given in all nutrient solution. It is a good practice to begin with a full dose or a nearly full dose. With Calimagic this is 5ml/gal and accounts for about 800 EC. This can be impossible during the seedling stage when the plants require a very low inflow EC. 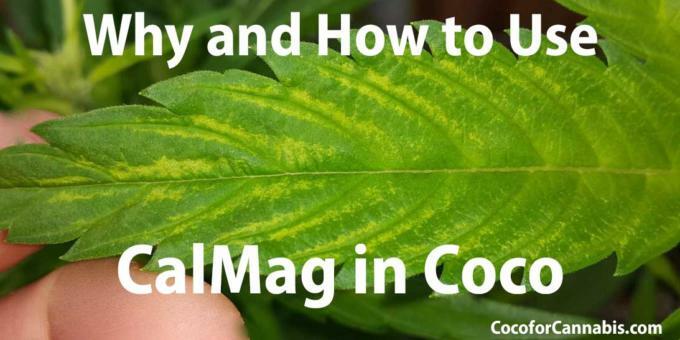 See our article, “How to Grow Cannabis Seedlings in Coco” for specific advice about dosing CalMag for seedlings. If you start out with the full dose and the plants avoid CalMag problems, then you can reduce the dose as you enter late vegetative growth. If you are using a prebuffered product like Canna or Roots Organics, then you may start out with a half dose. However, even with these pre-buffered products, Ca deficiency can occur if the dose of CalMag provided is too low. See our article, “How to Mix Nutrient Solutions” for a complete nutrient recipe schedule that will allow you to mix nutrients with the right dose of CalMag and everything else! If the plants are not having issues with Ca or Mg deficiency, then the dose can be lowered by half during flowering. This can be important, especially in mid to late bloom when you want to be able to provide a higher dose of phosphorous and potassium for flowering. By mid-bloom, plants should do fine with half the dose of CalMag that they required during vegetative growth. However, always watch your plants and be prepared to increase the dose again if symptoms of deficiency emerge. 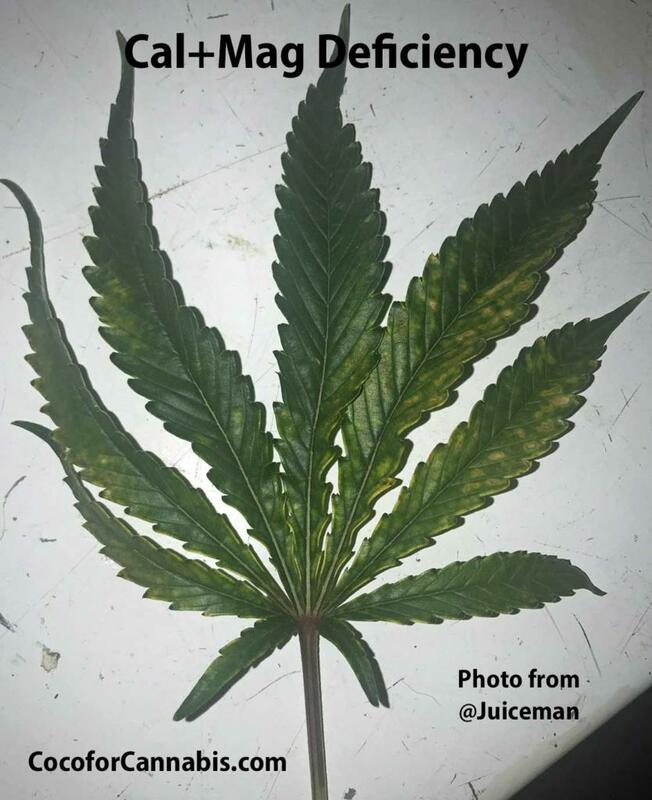 In mature plants, the first symptom is usually brown spots on lower leaves. 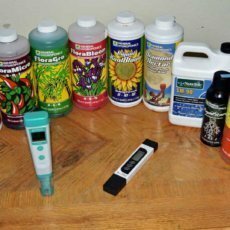 If you use buffered coco and follow these instructions, then you should be able to avoid or at least manage Ca and Mg deficiencies during your grow. If you run into problems, drop into our Grower’s Forum and we will be happy to answer your questions! I am a university professor and have taught courses in horticulture. I am coco for cannabis and I hope you are coco for cannabis too :) Grower Love!